Bob Garner was born in Pontiac, Michigan and grew up in Clarkston. Though he considers himself “the least interesting person I know,” he has been a longstanding figure in the background as well as the forefront of Michigan’s conservation history. He first entered the political world as an18-year old; the first teenager in Michigan to run for public office after a new law changed the minimum age. At age 21, Bob worked in the Michigan Senate for more than three years under Senator Kerry Kammer, who was at the time the youngest serving state Senator. Kammer credits Bob Garner with the idea to introduce the Kammer Recreational Land Trust Fund Act of 1976 (P.A. 204) creating the first iteration of what is now known as the Michigan Natural Resources Trust Fund. They worked together through a unique alliance of the Michigan Gas and Oil Association, Michigan United Conversation Clubs (MUCC), and state government leaders and lawmakers — with the blessing of former Michigan “conservation” Governor William G. Milliken and with the help of Bob’s long-time friend and hunting and fishing buddy Bill Rustem, then staff to Governor Milliken. In 1979, Bob worked for fellow Conservation Hall of Famer, State Representative Thomas Anderson and Bob served as the only aide to the House of Representatives’ Committee on Conservation, Environment, and Recreation. Bob recalls, “I came to work in the legislature when all things were possible, and right now all things are suspect… In spite of all that, I’m more optimistic about conservation now than ever. Sometimes out of your deepest morass, comes solutions”. Garner moved from behind the scenes in politics to in front of the camera on television in 1983, when he became producer, field producer and co-host of Michigan Outdoors. After seven years, he mentioned leaving the TV show to a group of legislators and word traveled fast—that day Speaker of the House Lewis Dodak invited Bob back to the legislature to help with the Firearms Preemption Act of 1990, which prevented local units of government from passing special taxes and ordinances to govern firearms more stringently than the state. He also went on to be assistant to Rep. Jerry Bartnik, who, back in 1984, had led the charge to protect the Trust Fund in the Michigan Constitution, which Bob helped with even though he was doing Michigan Outdoors at the time. During his two stints around the legislature, he was involved in the creation and the negotiation of many major initiatives. While with Rep. Anderson, Garner led legislation through the House that became the Michigan Wetlands Protection Act. Bob returned to television as executive producer and host of the Michigan Out-of-Doors television show from 1993 to 1998. He still enjoys his affiliation with Public Television at Central Michigan University, who actually named him an honorary alumni in 2012 for this fundraising work and continued work on their “Ask the DNR” and “Destination Michigan” shows. In the late 90s, Bob served on MUCC’s Board of Directors as treasurer. He resigned when he was appointed to the Natural Resources Commission by Governor John Engler in 1999. While he says he was honored, it wasn’t something that he had really sought out although four of his former supervisors over the years had also served on the NRC. Among the issues he was involved with over his eight years on the Commission were Bovine TB, the “deer wars”, being proactive on the Chronic Wasting Disease issue and the comprehensive land consolidation process. When he left the NRC, he was welcomed as a member of the DNR/DEQ retirees, even though he never worked for either. 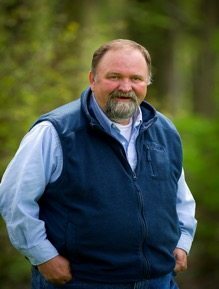 While it seems like his name has been synonymous with the Michigan Natural Resources Trust Fund since its inception, he still feels privileged for having served on the Trust Fund Board for 10 years now—3 years as an NRC representative, before being appointed in 2006 by Governor Jennifer Granholm and serving as chair for two terms. Garner says he’ll leave the Trust Fund Board in December 2013 after his term expires because he believes, as he did when he left the NRC, that new and younger voices need to be engaged in these discussions. Beth, his wife of almost 32 years, has joined him on several fishing and hunting adventures over the years, as has his son Anders (named for the late State Representative Tom Anderson), and his lab Theo. Bob considers his “crowning achievement” to be this past January, when Anders returned to Michigan with his wife Melinda and Bob’s grandsons Devin (7) and Drake (4). “The truth of the matter is I’ve had nothing but fun,” he says. He has hunted or fished in every one of Michigan’s 83 counties, many other states and provinces, but claims “It’s not what you shoot or catch that will bring you back, it’s what you see” and it’s the people that make these memories special. While Bob feels that there are many people that are in the Conservation Hall of Fame that did so much, and feels he “just stood on their shoulders and worked out the details,” we respectfully disagree. Bob Garner has left his fingerprints on every major conservation initiative over the last 40 years. We are proud and honored to add one more award in recognition to his lifelong commitment to Michigan’s natural resources and public lands, bringing the outdoors to living rooms across the state, and landmark conservation initiatives that will last many lifetimes. We hereby induct him into MUCC’s Conservation Hall of Fame.